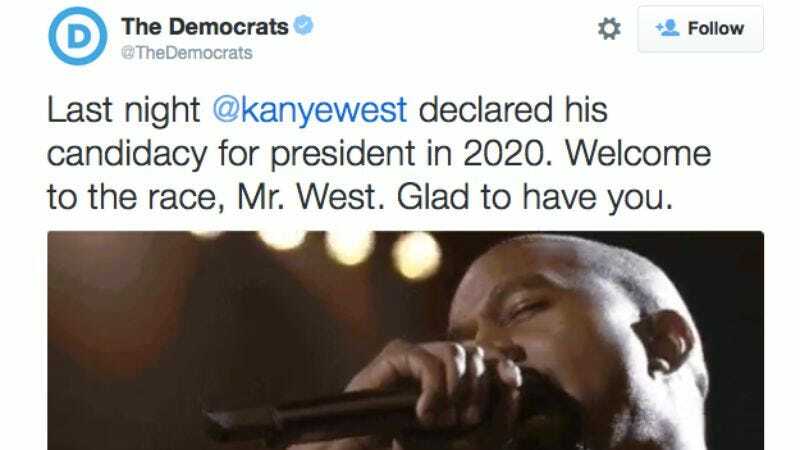 Since then, the account has been tweeting news about Republican presidential candidates along with accompanying Kanye West reaction GIFs. The whole thing would be a lot more charming and subversive were it not for the fact that using pop culture-related GIFs is actually commonplace for the Democratic Party on Twitter. Long before last night’s VMAs, the account was using images of Taylor Swift, Ludacris, Nicki Minaj, Adventure Time, and more to add a little humorous flair to its political musings, because nothing engenders faith in the democratic process like a tweet about abortion accompanied by a Gossip Girl reaction GIF. And for those who are curious: The official Republican Party Twitter account has yet to weigh in on West’s announcement. Perhaps the party is too busy trying to sue Barack Obama to find the right GIF.